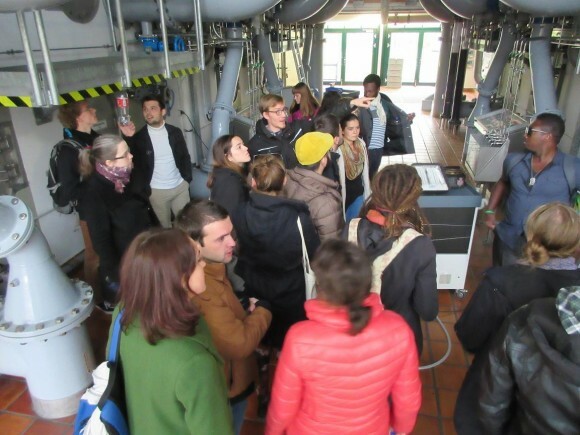 The EYCE training course “Food, Land and Water” was held in Dresden, Germany, from the 26th of October – 2nd of November 2014. The venue, fittingly to the theme, was a YMCA Youth Ship located by the river Elbe. The training course brought together young people interested and educated in environmental topics in order to offer new insights and give a chance to share their knowledge and to learn from the experiences of others. The daily programme included educational sessions with non-formal learning methods, prayers and evening programme. The training course aimed at raising awareness about distribution and responsible use of natural resources and empowering participants to make a practical change in their context. First day of the training course was about team building, group work and practical methods to prepare games about the environment issues. The evening programme was an International Banquet. The participants had a chance to introduce some dishes and drinks from their home countries, which offered a great possibility for intercultural learning and discoveries. Tuesday focused on the theme of land use. The participants shared situations concerning land use in their countries. Also, land grabbing was discussed. Guest speaker Topi Haarlaa from Finland introduced the EU subsidy system and its positive and negative effects on agriculture. Wednesday’s sessions were a Bible study on the Christian notion of stewardship, access to resources, as well as human rights and privatization of water. In the evening the participants experienced the night life in Dresden, guided by the German hosts Deborah and Gideon. Thursday was filled with study visits in Dresden. A visit to a water plant Tolkewitz gave the participants an overview on how the city of Dresden is supplied with water. At the Ecumenical Information Center they heard about the history and ongoing projects of the centre, which works with three themes: justice, peace and care for creation. After this the participants could choose to visit to the Technische Hilfswerke in Dresden to learn more about the floods in Dresden 2002 and 2013, and how this organization of volunteers offer help in case of natural catastrophes. A second alternative was a presentation of the water bank filtration. The intensive and interesting day came to an end with a German dinner at the restaurant “Alte Schankwirtschaft Zum Schiesshaus” located in Dresden city. Friday before lunch the participants had free time to for sightseeing and resting. However, the afternoon sessions focused on the topic of common, but differentiated responsibilities, as well as the Millennium Development Goals. During the evening programme, the German culture was presented through fun and games. Saturday, the last day of the training course, was dedicated to discovering ideas for an ecological lifestyle and planning on how to raise awareness of the topics of the training course in participants’ own contexts. Several practical workshops, e.g. on calculating one’s environmental footprint, discussing the tap water vs. bottled water and environmental migration, were held. After final evaluation of the week the participants celebrated a Farewell Party and said goodbye with hopes of future shared projects.